“No one, not children, not politicians, not business leaders, not religious leaders, not even the president of the United States—no one gets to use a crisis or a tragedy to take away any of our civil rights,” Women Against Gun Control’s Janalee Tobias told the crowd of Second Amendment supporters on April 14. 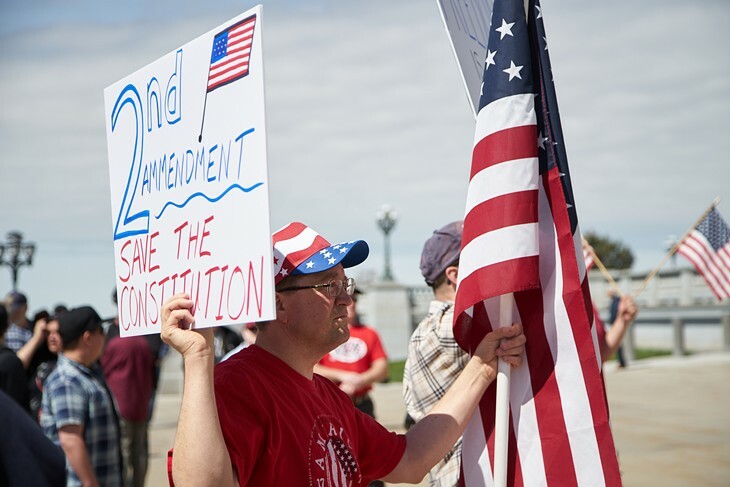 James Waller hadn't planned on spending his Saturday afternoon rallying with a horde of fellow Second Amendment supporters until his local gun store sent him an email tipping him off to a planned gathering at the Capitol steps. 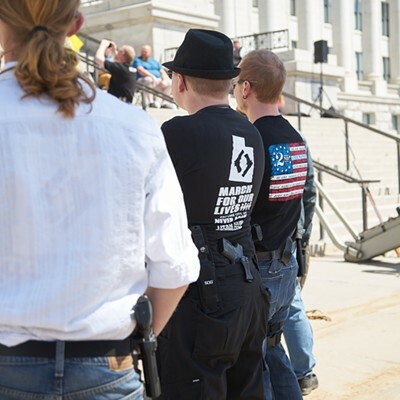 Related Sun's Out, Guns Out: Couple hundred gather at Capitol steps for pro-gun rights rally. 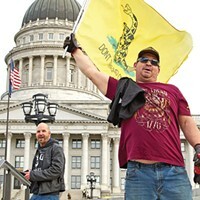 Couple hundred gather at Capitol steps for pro-gun rights rally. “God gave us 10 commandments. Only 10,” one speaker told the crowd, "but when people want something, they disobey laws to get what they want." 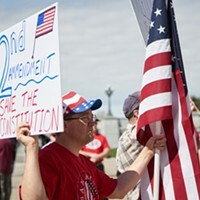 The Gardner family made the gathering a kindred affair, bringing their young children to exercise their First Amendment rights to voice their support of the Second. Nate Gardner, father and sixth-grade teacher, said his son fired his first gun around age 2, and estimated his daughter did the same around age 3 or 4. "Honestly, if we start them earlier, they won't fear the gun," Gardner said. "They'll respect the gun." They were in vocal company. 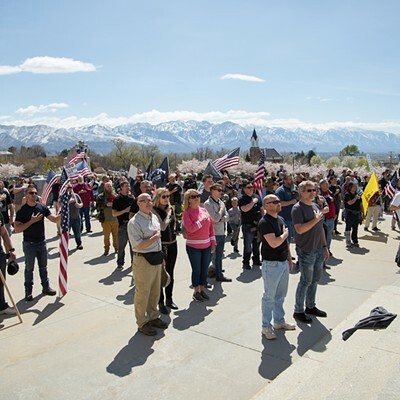 The couple hundred folks who gathered at the Capitol on April 14 joined in with "the support of thousands of American Patriots across this great country," according to the National Constitutional Coalition of Patriotic Americans' website, which called for said patriots to rally at state capitols across the U.S. to "show our support for our [Second] Amendment rights and to support our Constitution as a whole." 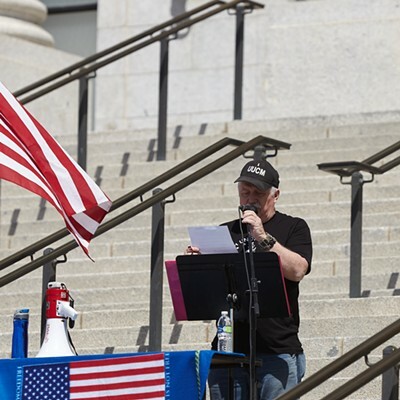 Some 10 speakers addressed a range of topics, from the need to "streamline the death penalty," to the "God-given right to self defense," how Second Amendment supporters "have to be vigilant," the necessity to "reach out to the other side" and contacting local representatives if they threaten their constituents' gun-bearing rights. 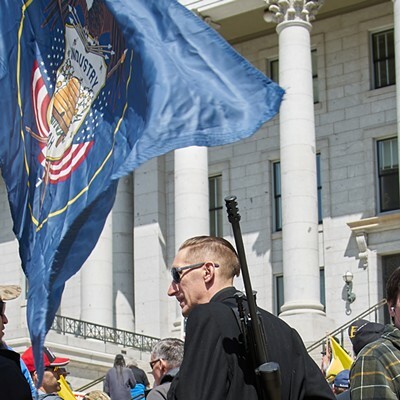 Groups participating in the rally included the Utah Unorganized Constitutional Militia, a coalition that, according to its Facebook page, aims to "protect individual freedom"; Women Against Gun Control, a group of "ladies of high-caliber" whose website notes that, "The [Second] Amendment is the Equal Rights Amendment"; High School Kids for Guns, whose representative at the rally, Collin Thorup, spoke about not participating in the student-led March for Our Lives demonstration on March 24 in which his classmates walked out of class in support of gun-control legislation; and, among other supporters, Stonewall Shooting Sports, "weapon advocates and owners in Utah" who stand "for the legal, responsible and safe use of weapons for our self defense, recreation and weapon-sports competition." 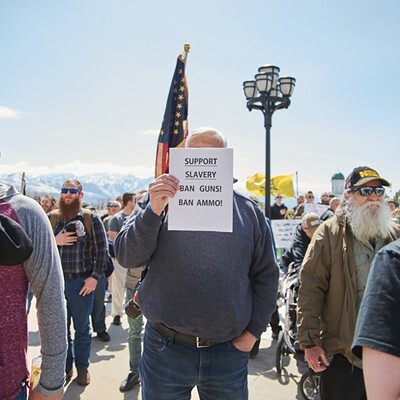 After attendees recited the Pledge of Allegiance and sang the national anthem en masse, the many gun-carrying, flag-wearing, sign-holding members of the crowd shouted out a range of responses to the speakers over the roughly two-hour rally, including: "Assault is an action, not a gun! "; "There are no ugly guns! "; and "We're proud of you!" Some also offered to drive, or pay for, gun-control advocates' "Commie asses" to be sent away from the U.S. to nations that have passed gun-control legislation. Villina Greenwell is from one of those countries. 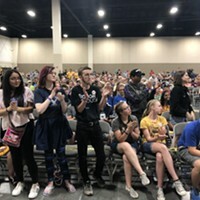 The Australian speaker told the crowd about her country of origin's gun-control laws and gun buyback program, which she said, contrary to popular belief, is no model for U.S. gun laws. "I lived it," Greenwell said. "Don't believe the mass hysteria of the liberal left wing media. It's rubbish." 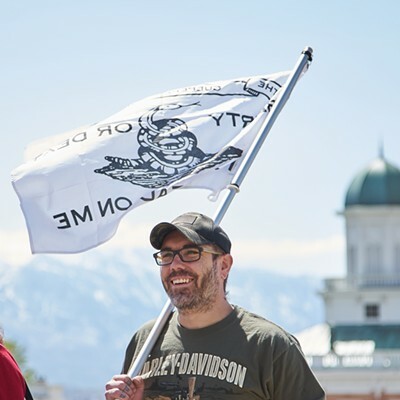 Steven Lund, owner of West Jordan's ACE Firearms, spoke of the need to "hold criminals responsible for their actions" and train some teachers in defensive tactics after arming them and putting a safe in their classrooms that would notify the cops when it was opened. "As my God-given right to self defense, I want a bigger gun than my enemy," Lund said. Robert Whalen, from the Unorganized Constitutional Militia, introduced most of the speakers. 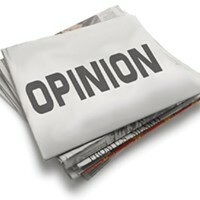 Referring to the people who want to pass gun-control laws, Whalen said, "they are not our friends. They are not our allies. They definitely are not Americans." Every gun bill that has been passed, Whalen said, is a violation of the Second Amendment. A 10-year Utahn, Waller moved to the Beehive State from Los Angeles, Calif. "When I first moved here, I thought, 'You can buy firearms?'" He said. Now, he owns three of them, which he said he uses for recreational purposes like shooting cans and dirt. Waller said gun-control measures are about disarming law-abiding white populations, arguing that "the United States does not have a crime problem; the U.S. has a demographics problem." Janalee Tobias, founder and president of Women Against Gun Control, said in a phone interview two days after the rally that she considers the gathering a success, and that she's "very pleased with the media turnout," recognizing that many consider media outlets, including City Weekly, to ooze liberal bias. "Our side deserves to be heard," Tobias said of "typical gun owners," whom she called "good people." "I don't know of any more plans to protest," Tobias wrote in a follow-up email. "What I'd really like to do ... is not to protest. It's time for us to meet and talk personally instead of rallying. 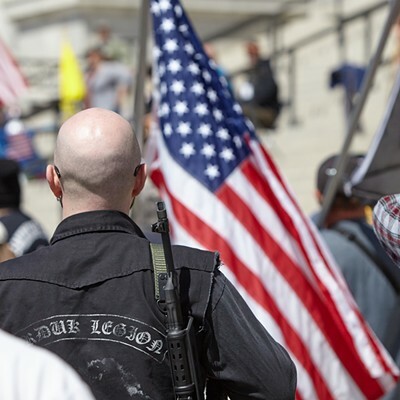 The pro-gun people have a hard time taking time off work, family responsibilities, church responsibilities to take time off to attend protests." 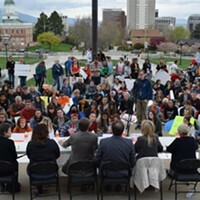 The rally followed a late-March walkout by high school students in which 8,000 kids, parents and supporters from across the state gathered at the same Capitol steps to demand a legislative fix to end gun violence in schools. Tobias says she's gotten a lot of hateful responses to her pro-gun stance. "People think just because I'm pro-gun means I don't care about kids. "It tugs at our heartstrings to see these high school kids marching in the streets. To think that they're going to school and have to worry about a mass shooter," she says, rejecting the idea that just because she's a vocal gun supporter means she's against the safety of high school students. "It's painful to see them have to worry about this." Speaking at the rally, Tobias said that, as sons and daughters, mothers and fathers, friends and neighbors, "We mourn with the victims of every school shooting." "If we don't start attacking crime at the root, nothing's ever going to change," she said. 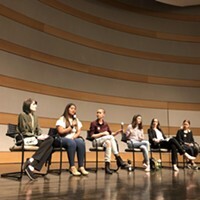 Area high school students, former and current representatives spar over gun reform. 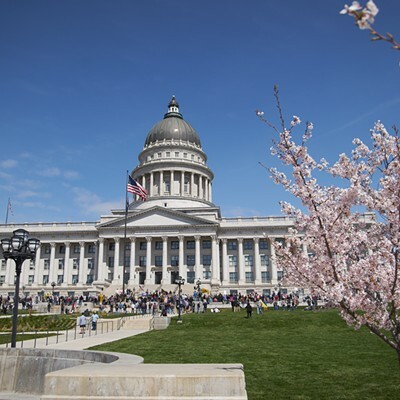 Utah students gather at Capitol to demand gun-reform legislation.